Why Didn't Banks Get Robbed (Very Often) In the Wild West? 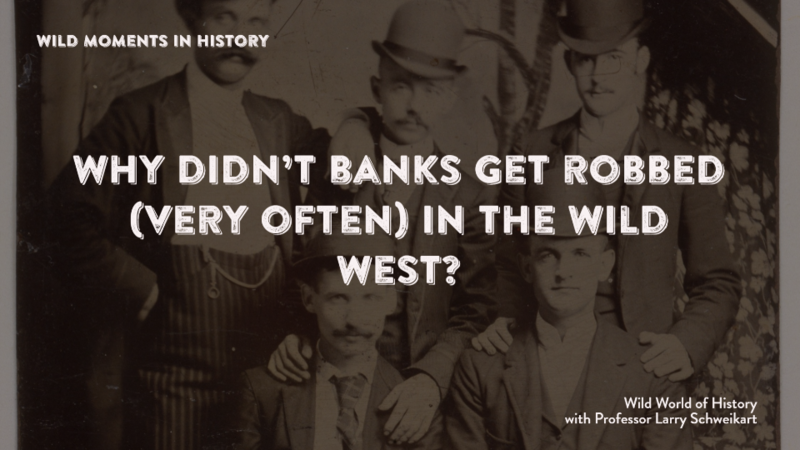 Did you know bank robberies were not common in the Wild West? It’s a scene out of half the western movies ever made: a group of masked bandits ride into a sleepy town, rob the bank, and ride out, six-guns blazing. But it’s not accurate. Such scenes were about as common as UFOs landing in Central Park. To understand why there were no successful bank robberies in any of the major towns in Colorado, Wyoming, the Dakotas, Kansas, Nebraska, Oregon, Washington Idaho, Nevada, Utah, or New Mexico, and only a pair of robberies in California dn Arizona before 1900, it is important to appreciate the location and construction of bank buildings on the frontier. Bankers always placed their buildings in the center of town, where businesses surrounded them. On the frontier, most towns featured “concealed carry” or, more likely “open carry” so that much (if not all) of the citizenry was armed. In addition, sheriffs and deputies were nearby. Townspeople noticed new faces immediately, and prepared accordingly. The notion that a band of five or six complete strangers would go unnoticed is sheer fantasy. Even if a gang could easily execute a daring holdup of a bank, the thieves still had to escape through a population in which every armed citizen had a direct monetary interest in stopping the getaway. And a posse would follow in minutes. Were banks vulnerable in other ways, say, to explosives during the night? Bank walls usually adjoined other buildings, with the vault located on an interior wall. It was possible to blow open a vault, but that did not guarantee access to the safe, which stood inside the vault. Early safes were “ball” safes, in which a large iron ball containing the cash stood atop a large metal box with legs. The box held important documents and non-monetary valuables. It was almost impossible to blast open a ball safe using the dynamite of that time, because the round shape of the ball diffused the explosive effect and there was no way to affix a charge to the exterior of the safe. If the crooks chose to blow off the ball from the box, they had to figure out how to get a several-hundred-pound iron ball out of town, which at the very least would would have required a wagon. In short, the vault and safe alone deterred most crimes. When combined with the banks’ location, few bandits wanted to attempt a bank robbery. A few did occur, including one in Nogales on the Arizona-Mexico border at the turn of the century and a couple in California. In Colorado, the members of Butch Cassidy’s gang attempted to use a vial of nitroglycerine to coax a bank president into opening his vault, but the heist failed. Otherwise, bandits discovered it was far easier to rob trains and stagecoaches, as seen in the records of Wells Fargo, whose stages suffered recurring holdup attempts. Not until the 1920s, with the proliferation of automobiles, did bank robberies in the wild west become a reality. Where then did the myth come from? Several raids by the famous James Gang and Quantrill’s raiders in the Minnesota-Missouri region contributed to much of the bank robbery mty. Otherwise, like the frequent movie plots involving robbing Fort Knox, western bank robberies sprang to life entirely out of the minds of writers. For further reading, see Larry Schweikart and Lynne Pierson Doti, Banking in the American West from the Gold Rush to Deregulation, and John and Lillian Theobald, Wells Fargo in Arizona Territory.